TWO OF A KIND. Likely to cause possible recognition confusion are these two twin-boom cargo transports, the U.S.A.F., French-based Fairchild C-119C-FA Packet (photo) and the Nord 2501 Noratlas, the latter now engaged in North African operations against the rebels. A sky-writing North American AT-6A Texan (ex-Flygvapnet Sk 16) bought in May 1955 by Herr A. P. Botved and normally based at Dusseldorf. Smoke chemicals are in rear cockpit and fed to engine exhaust through stack. Visible in background is B.K.S. 's Auster 5 G-AKWS. TWO OF A KIND. Likely to cause possible recognition confusion are these two twin-boom cargo transports, the U.S.A.F., French-based Fairchild C-119C-FA Packet and the Nord 2501 Noratlas (photo), the latter now engaged in North African operations against the rebels. This recent production model (2501-90) has the now standard increased area dorsal fillet. The Noratlas is to be built (112) in Western Germany by Flugzeugbau Nord. An initial batch (25) will be French-built. PANAMANIAN PBM-5R. With crudely-daubed ferry registration N10419, this ex-U.S. Navy Martin PBM-5R Mariner (BuAer 95011) was photographed on its way from N.A.S. Norfolk, Va., to Panama. The U.S. Navy is now releasing all of its PBM-5 Mariners to civilian buyers - less radar and armament. 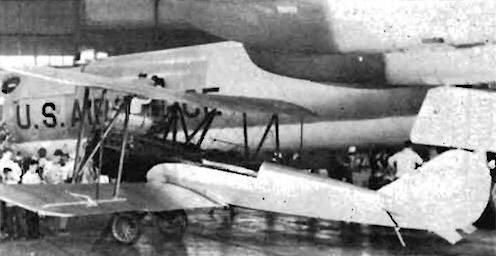 In this case, the PBM-5R was already converted as a forty-eight "bucket-seat" transport (five crew). Note the JRM Mars-type bows' transparency . First seen on PBM-3Rs and PBM-5Gs (U.S.C.G. ), PBM-3Rs were U.S.N. contract-flown by P.A.A. and AmExport Airlines during the war. Smartly bedecked with "Royal Air Force" on the white top decking is this de Havilland D.H.114 Heron Srs. 2 (XG603) which is based at Washington, D.C., for the use of the British Ambassador, Sir Roger Makins. Only Convair T-29A resident in Europe is based at Sculthorpe, attached to the 47th Operations Squadron, U.S.A.F. The T-29A is a direct Convair 240 conversion with four dorsal astrodomes and built-in steps as shown in this photo of 49-1941-A (c/n. 20a). The suffix "A" indicates "last three" serial duplication . Latest Steve Wittman Tailwind (N9052C-Exp'l.) has a larger-area, redesigned fin and rudder. The single-rod landing gear is the latest development of the Wittman-patented oleo-leaf leg. The Tailwind is powered by a 115-h.p. Lycoming. 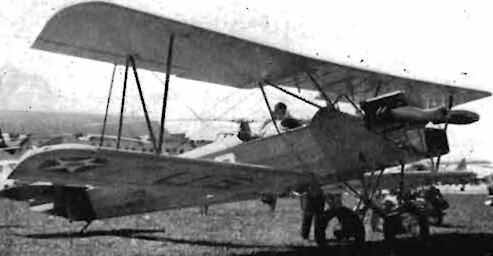 A 1928/30 Swiss-built Comte A.C.4 Gentleman (ex-CH-262) two-seater is still flying. Owner is A. Kammacher of Lausanne. Power is a 140-h.p. close-cowled, British-built Armstrong Siddeley Genet Major. This 1925-designed Consolidated PT-1E (A .C.26-233) two-seat primary trainer is owned by Hollywood's Paul Mantz and has appeared in the film "One Man Mutiny". Engine is 180-h.p.Wright V-720. No Piper Cub but an original single-seater, the Kraemer LK-1 Rapid Rambler (N6002V-Exp'l) cruises at 95 m.p.h. on 65 h.p. Continental A-65-8. Span 24 ft. 6 in. ; length 18 ft. 3 in. L. A. Kraemer of Rapid City, South Dakota, is owner-builder. The 1952-built prototype Piaggio P.150 (T-6 Texan replacement) now has revised duo-bubble canopy and a machine gun in the starboard wing-camera in port wing. No production order is anticipated. The 1941-built Player Monoplane (N21778) has unusual all-wood (fabric-covered) Geodetic construction (as Vickers Wellington). Power is 65-h .p. Continental; a.u.w. 750 lb. ; cruise 100 m.p.h. ; span 30 ft.